Unlike many nitpicky party poopers out there, I really love Peter Jackson’s big-screen rendition of The Hobbit. It’s fun, action-packed and just great to see, even though it doesn’t stick entirely to the source and is spread out across three movies. However, just a few minutes into the movie, we meet Legolas’ daddy, the king of the wood-dwelling pointy ears: Thranduil. When he came riding in on his elk-moose thingy, I was reminded of one of my favourite aversions: Elves. From the day I fell in love with fantasy fiction and role-playing games, I have always despised Elves. Something about them just really, really irritates me. Over the years, I have found out what it is about these often immortal, fair beings of the mystical places, and it saddens me every time an author or game designer portrays the pointy-ears in a way that incorporates those features. Wanna know what they are? Well, I have the urge to share my hate with you, so read on and bask in my animosity! First of all, Elves are perfect. Everything you can do, an Elf can do better. Think you’re the greatest archer in the world? Sorry, but that Elf over there just shot a penny from a distance of five miles while fighting off a group of Orcs. Thought you were the greatest wizard to ever roam these lands? Think again, because that smug-faced treehugger over there has been channeling cosmic powers since first grade! I just can’t stand this perfection most Elvish races in the fantasy genre have, because it makes all other races in a setting look kinda dumb. Yeah yeah, Dwarves have their blacksmithing and humans are somehow always the heroes, but that’s probably just because the Elves are too busy being utterly majestic. Second, Elves are always pretty. 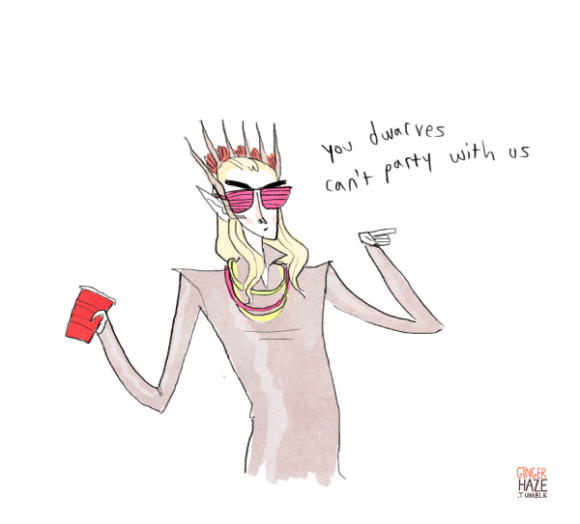 Legolas is pretty, his father pretends to be pretty (he would be without that dumb crown), Drizzt would never say he’s pretty, but according to the fan girls he is, and the list goes on! Beauty is nice and well, but it’s just lame that all Elves are handsome. I’ll give a digital high-five to the person who writes a book with a really, really, really ugly Elf as the main protagonist. I’ll buy that book the moment it hits stores, no matter how retarded the plot is. Finally, Elves always have some mystical power. They are either immortal, naturally magical or both at the same time. In the German tabletop RPG Das Schwarze Auge, Elves are so damn magical they sometimes craft items and enchant them without noticing. How stupid is that? Could you imagine an Elf making a beautiful necklace for her husband, but it turns out she wove a barkskin spell into it, turning her hubby into some kind of treant? That would at least explain why a large part of the Elvish population lives in forests, and why they care so much about their damn trees. Really, the only setting that has made Elves interesting for me is Dragon Age. In the world described and shown in the BioWare games, Elves are a kind of gypsy-like race, who have to live in ghettos and who are almost extinct. They have to face persecution and hate every day, but they don’t surrender. They fight for their place in the world, and ally themselves with the forces of nature. They are an interesting race with many problems, but also with enormous reserves of hope and positivity. They’re not perfect, they’re not always magical and surely not always pretty. I salute BioWare, for showing the world how Elves should be. Well, considering I’m writing this post without fire and brimstone falling from an ashen sky, we can be sure that the end of days will not be today. What we will get, though, are some nice discounts on Steam. Next to some really sick prices on some really epic game bundles, The Secret World is now available with 25% discount. So, if you haven’t checked the game out yet, give it a spin for just a bit more than €20 (or whatever currency you’re using). Trust me, supernatural monster hunting and conspiracy-solving was never this fun!